Medical Malpractice in Montana | What Is the Law? Medical malpractice is a hot issue in Montana as its legislature considers various malpractice related bills. Stears said covering bases in his line of work often means exposing patients to undue radiation for tests that have a one-in-a-thousand probability of finding an illness. So our friend Bob agrees to expose patients to undue radiation because he wants to help the referring doctor cover himself to avoid a medical malpractice lawsuit. Bob, do you realize what you are admitting here? Other than me, does anybody? The law in Montana is that a medical malpractice plaintiff has the burden of proving through qualified, competent expert testimony what the alleged applicable standard of care is, how the alleged standard has been allegedly breached, and how the alleged breach has causally resulted in the alleged injuries. This is the law in most jurisdictions. Interestingly, the Panel’s deliberations are confidential. “The panel’s decision is without administrative or judicial authority and is not binding upon any party.” Records submitted to the Panel are not to be made public. Moreover, Panel members cannot be called to testify in court about the Panel’s considerations, transcripts are not made, and the decision and reasoning of the Panel are not admissible as evidence in an action subsequently filed in court. In court, the claims starts all over again regardless of what the Panel found. 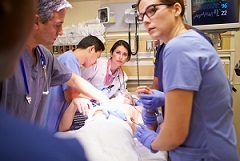 (1) Action in tort or contract for injury or death against a physician or surgeon, dentist, registered nurse, nursing home or hospital administrator, dispensing optician, optometrist, licensed physical therapist, podiatrist, psychologist, osteopath, chiropractor, clinical laboratory bioanalyst, clinical laboratory technologist, pharmacist, veterinarian, a licensed hospital or long-term care facility, or licensed medical professional corporation, based upon alleged professional negligence or for rendering professional services without consent or for an act, error, or omission, must, except as provided in subsection (2), be commenced within 3 years after the date of injury or within 3 years after the plaintiff discovers or through the use of reasonable diligence should have discovered the injury, whichever occurs last, but in no case may an action be commenced after 5 years from the date of injury. However, this time limitation is tolled for any period during which there has been a failure to disclose any act, error, or omission upon which an action is based and that is known to the defendant or through the use of reasonable diligence subsequent to the act, error, or omission would have been known to the defendant. The running of the applicable limitation period related to a malpractice claim is tolled upon receipt by the director of the application for review as to all health care providers named in the application as parties to the panel proceeding and as to all other persons or entities named in the application as necessary or proper parties for any court action that might subsequently arise out of the same factual circumstances set forth in the application. The running of the applicable limitation period does not begin again until 30 days after either an order of dismissal, with or without prejudice against refiling, is issued from the panel presiding officer, or from the director upon the consent of the parties to the claim, or after the panel’s final decision, whichever occurs first, is entered in the permanent files of the panel and a copy is served upon the complainant or the complainant’s attorney if represented by counsel, by certified mail. There is also a 5-year statute of repose. Regrettably, Montana law limits the recovery of non-economic damages. past and future. in any malpractice case to $250,000.00. This cap applies regardless of the severity of the non-economic losses incurred. The practical impact of this law is that it kills most medical malpractice cases. So many victims in Montana cannot find a lawyer because lawyers are not interested in cases where the economics do not allow for malpractice claims. Our firm may spend well in excess of $100,000 for a malpractice case. The numbers do not make sense for an ordinary case. Birth injury cases are the most notable exception. Why? Because there is no cap in Montana on economic damages.